Many people feel that having a baby puts a big fat limitation on their ability to adventure. But does it really have to be that way? True, there are inescapable challenges to parental life, the diaper changing, the inconsistent sleep, and let’s be honest, the noise; but do those things really have to stop you from living the kind of life you want, including going camping? We say no, and that in fact, it’s actually never been easier, especially when van camping with a baby. So don’t allow parental pessimism place unnecessary limits on your freedom. Here is a quick guide to camping with a baby, and also why van camping is ideally suited for it. Although this post is meant to inspire you to feel more free, it’s also important to be practical, especially when your precious child is involved. While you certainly can go camping with a baby, you also have to do so with safety in mind. For instance, it’s probably a good idea if you are no more than 1.5 hours from a hospital or clinic. That’s a distance at which, if a non-emergency arises, you can make the trip and come back in a day, if needed. On the other hand, if a true emergency arises, you’ll probably be depending on medical evac, anyway. These are great things to have even when not camping, and come in a variety of types and styles. Many are simply a cloth sling, don’t take up much space packing, and are easy to use. Unless you plan on staying very close to your campsite, baby carriers are essential, and will drastically improve your mobility when van camping with a baby. Of course it may never get cold, depending on the time of year and location you’re camping, but it’s always important to have at least one set of warm baby clothes. Even in the Summer, it’s possible to get cold, especially in drier climates; or consider that you might actually use the van’s air conditioning, in which case the baby might get cold regardless of outside temperatures. Going camping is an unusual experience for a baby, and new experiences can mean a bit more stress than usual on the body. This is why it’s extra important to take care of the basics such as hydration, and not just staying warm, but also staying cool in hot weather. Another important matter to consider when camping with a baby is not just the baby, but also the people around you. It’s a good idea to start up a friendly conversation with any nearby camping neighbors, and make sure to mention that you’re camping with a baby. Of course, they’ll have figured this out on their own eventually, but putting your friendly face forward can help to minimize any annoyance or complaints on their part. Camping with a baby is truly better in a van, for many reasons. For instance, it makes it much more practical to camp with other people, because there is a quiet space you can retreat to when the baby is crying. 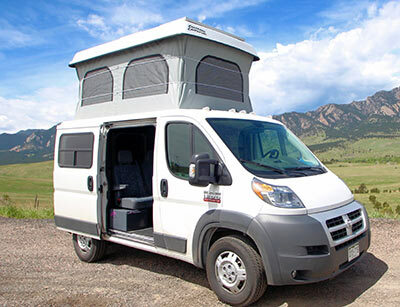 However, that quiet space is not just your car, as would be the only option when tent camping with a baby, but instead is a very comfortable van, with couch, table, and amenities like sink and air conditioning. On top of that, if you do need to leave for some reason, such as an ear infection or bad temperament, there’s much less packing up to do, no tent to take down, etc. Just as camping in a van is better generally, there’s that added layer of advantage when it comes to camping with a baby. We are open 7 days a week by appointment only 8am-6pm. Please call or email us to schedule an appointment. Denver - 7 days a week by appointment only 8am-6pm. Las Vegas - 7 days a week by appointment only.